A pavilion commemorates the centenary of the crossing of the Blue Mountains in 1813 by Blaxland, Lawson and Wentworth. It was J. W. Berghofer, President of Blaxland Shire and also a trustee of the reserve, who initially suggested the idea of the centenary celebrations. Mount York was also reasonably close to the main railway line at Mount Victoria, and of sufficient area that large crowds could be accommodated. Despite fundraising efforts and a special purpose Treasury grant of £700, the Centenary Celebrations Committee of 1913 had to concentrate its efforts on only a few main projects and locations due to financial constraints. A major element proposed was the erection of a memorial pavilion planned to cost £400. 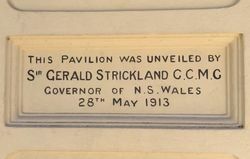 The design for the memorial pavilion was prepared by George Sydney Jones, of Jones and Southcott, Architects, Sydney. The neo-Classical style pavilion with eight columns, cupola and a central tablet of polished trachyte, was intended to be the focus of the 1913 Centenary celebrations. The contractor was Mr F. T. Collas of Marrickville, with the memorial tablet supplied by the monumental masons, Loveridge and Hudson. This structure was dedicated to the explorers Blaxland, Wentworth and Lawson, the surveyor George Evans, the road-builder William Cox, and the visionary governor Lachlan Macquarie. The pavilion was incomplete on the day of the official centenary celebrations, as rain had delayed the construction work. It was not finally completed until December 1913. 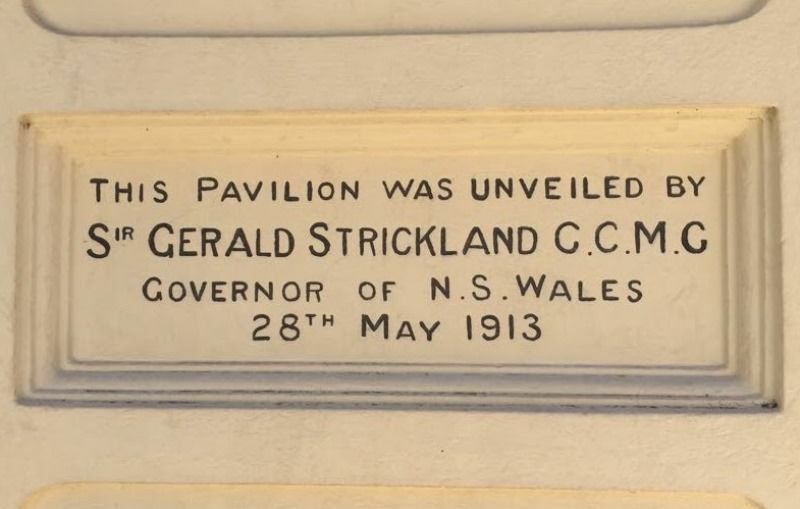 This pavilion was unveiled by Sir Gerald Strickland G.C.M.G. This plaque was placed on the 28th May 1988, being the 175th anniversary of the crossing of the Blue Mountains by Blaxland, Lawson & Wentworth, to honour those who pioneered the wat, and the dedicated settlers who followed by their efforts in opening up the inland, they led a small penal colony towards the Australia of today.